Organic Latex Pillow, solid natural latex core supports your head and neck, certified 100% organic Natura Grow Wool™ lining wicks away moisture to keep you dry,certified organic cotton sateen cover. this organic pillow is also anti-microbial and free of allergens. 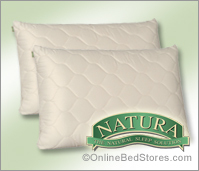 OBS recommends the nature organic Latex pillow for anyone who suffers from allergies or is chemical sensitive.